I used a profile by Moderator [Marco] but since I'm a PC player mapping to console, these settings didn't really apply. Keep in mind, this is my first time mapping Keymander but not the first time mapping keys, i'm running into a two problems though. First, PC mapping has gernades set to "G", this is fine but there's a function in Apex Legends that requires you to hold "G" to bring up an inventory menu. The problem here is that, i think Keymander has a hard bind to "HOLD G" that enables you to either use "WASD" as movement or something else entirely. I can't select anything in the inventory menu with my mouse whild holding "G" because i move around rather than try and select something. Second, Apex Legends requires you to hold "L1+R1" to proc an Ultimate, when i try to macro this function in Keymander, nothing happens. Am i doing something wrong? Thanks for your time and any help is appreciated! Make sure you turn on macros first to be able to use them. The grenade menu require you to use the mouse to select which grenade you want to use. Are you using the PS4 profile or the Xbox One profile? How else do I enable macros other than mapping them? Also, I think it's the PS4 profile. I know the mouse is required to sift through my inventory but all it does is move me as if I was using WASD. Make sure you press F11 on your keyboard, this will activate the Macros! And for the "G" key issue, go to button assignments, click on the left joy stick, on the box to the left where it shows the bind for WASD, there is a small controller in the top right corner. Click on that then select stick simulation settings. Select OFF and then you shouldn't have that problem. Those two solutions worked out! Now its a full copy of my PC mapping! Thank you! On second thought, I was wondering if you could help me out a bit more. Everything is set and works but the timing of my mouse seems to be off a tad or sometimes "over aims" at times, mostly on the X axis from what I've experienced. I've tried adjusting the sensitivity and although that enables me to look around faster, the "precision" isn't there. Not sure how to explain it, but I hope you get the gist. Try adding a small curve in the mouse curve settings. You can also try lowering the acceleration. Do you mean the mouse velocity curve or the deadzone setting? Yes that is correct the mouse curve. NOT the deadzone. Yeah, I reduced the deadzone to virtually nothing. Its give and take with the curve and sensitivity though, so I just have to keep messing with it. Hey I don't have access to a normal computer as I only have a Mac so I am unable to download the game profile. I've tried to manually bind the keys however after clicking one of the 'F1/2/3/4/5/6/7/8/9' buttons on the keyboard it doesn't let me bind anymore when clicking the back and start button on my Xbox remote. Does anyone have a fix for this? And would anyone have the key binds for Apex Legends and PUBG? 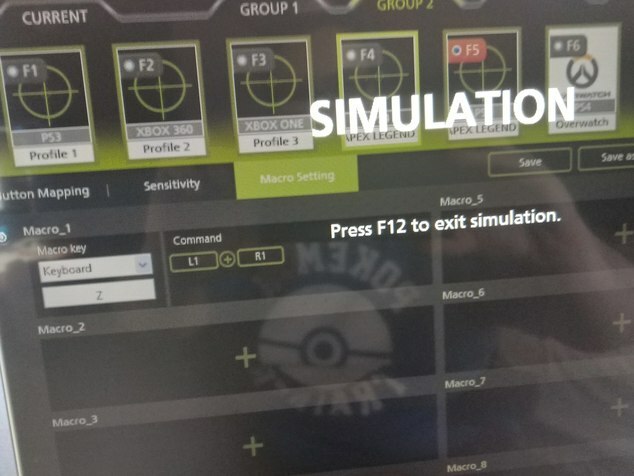 From my experience, after adjusting my profile, I click "Simulation". This allows me to use my mouse and keyboard on my console, once I want to readjust my profile, I tap "F12". This disables simulation and gives control back to my desktop. I then rinse and repeat until I get my desired settings, I save and load up that profile on my next session. Hope this helps. I didn't really "click" a profile, I just started binding my keys when I realised you could set profiles and as soon as I clicked 'f1' I wasn't able to bind keys anymore. I'm not sure if I've done disabled it somehow but idk what to do. What lights do you see on the Keymander? Do you have access to an Android device? We are having some issues loading profiles to the app's back end, but let me see if I can get the profiles uploaded to it so you can pull them down. Is there an Android app I can get to set-up the profiles? If there is then how do I load them into Keymander? Yes, the KeyMander app is on the Google Play store. We have several profiles preloaded on the app, but we are working to add Apex Legends and other recent releases to it. Once you have the app go here to read how to connect. Thanks for that. I have a Google pixel 3 so I believe I have the USB type c. How else would I connect this? am I able to upload any profiles I have downloaded to the Keymander from my phone?? You need a USB C to Micro USB adapter, once you get that it should work! The keyboard should work without the phone there so we don't have to worry about that part. What lights do you see on the keymander? What port do you have the console connected to on the Keymander? What happens when you connect the controller to the Keymander? Does it turn on and stay on ? Or does it just buzz and then shut off? Hi, would you be able to share your final profile. Would love to have Apex configured as on the PC. Are you also able to handle Crouch toggle/hold and assign Reload (R) and Interact (X) to different buttons. As for your question regarding the mouse settings, you might want to change the dpi setting for your mouse to a setting that matches your mouse's dpi. Hope that helps. I'd need to check the mapping but I know I had to compromise because I don't think you can map two functions to one key. The Crouch toggle/hold would have to be done within game. It is not possible through our software. You can create a single button Macro for the second bind (interact) then you will have to keys binded to the same button.